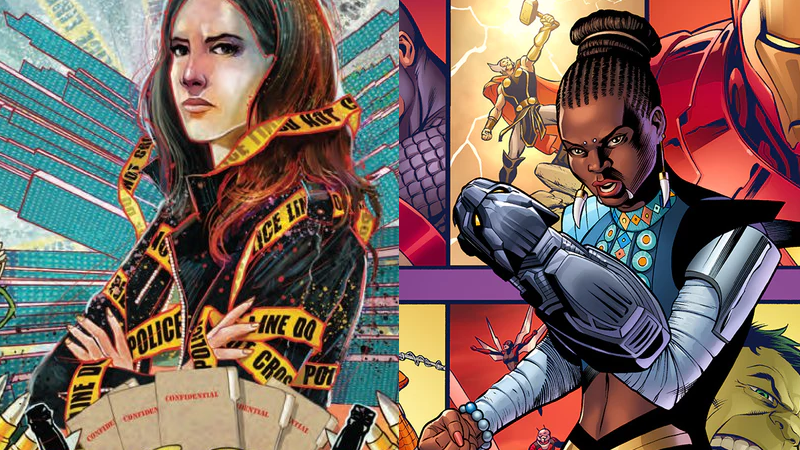 Jessica Jones and Shuri, coming to a comic book shelf near you! It’s news that should come of no surprise to either people who saw Black Panther earlier this year or were aware of the conclusion of Brian Michael Bendis and Michael Gaydos’s run on Jessica Jones, but two beloved Marvel heroines are getting all-new comic series. And you can actually start reading one of them right now! Revealed by Bustle this week ahead of San Diego Comic-Con, Shuri will be written by author Nnedi Okorafor, who made waves at Marvel recently working on the digital Black Panther miniseries Long Live the King, with art by Leonardo Romero. The main cover for Shuri #1. The series appears to have some loose connections with the sci-fi happenings of the current Black Panther book—set in the wake of a space-bound accident that’s left T’Challa missing in action, Wakanda looks for a ruler to replace their absent king...and turns to his beloved sister, rooting her up from her exciting life in her lab as she finds herself wrestling with the heavy mantle of rule. Shuri’s first issue will hit shelves this October. Meanwhile, in the wake of Brian Michael Bendis’ departure from Marvel to work on Superman at DC this year, the Jessica Jones ongoing is being relaunched with a new creative team, helmed by writer Kelly Thompson (who is also working on approximately one zillion other projects at Marvel, including a West Coast Avengers relaunch and a new miniseries about the recently-wedded Rogue and Gambit) and featuring art by Mattia De Iulis. And, surprise, you can actually buy the first issue digitally right now! The cover for Jessica Jones #1, available right now. The new series is actually coming in a rather intriguing format according to Thompson, who took to Twitter in the wake of the book’s announcement to reveal more about Jessica’s latest adventures. Although Jessica Jones is an ongoing series re-launching with today’s #1, it will actually release in three-month-long arcs as a digital-only series, with each issue being a bumper 40 pages long. At the conclusion of each arc, Jessica Jones will take a brief hiatus and the three digital issues of the arc will then be published as a physical trade paperback before the series returns with another adventure. It’s almost like a Netflix show, but with each season being a set of 3 comics. Which makes sense for Jess, given her own Netflix show! It’s a really cool experiment, and it’ll be interesting to see how this format plays out for Jessica Jones.